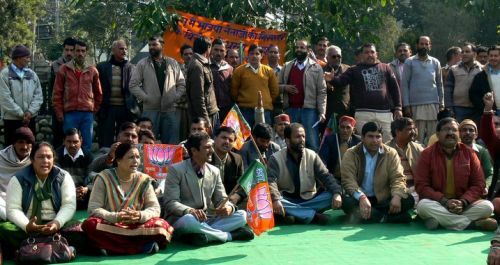 On the arrest of senior BJP leaders Arun Jaitley, Sushma Swaraj and Ananth Kumar in Jammu on Monday, the Distt Bilaspur BJP protested against the centre and state government of Jammu and Kashmir. Senior leaders of Distt. BJP MLA Kot Kehloor Randheer Sharma, Distt BJP president Baba Ranjeet Singh, newly elected Zila Parishad vice chairman Anoop Mahajan, Bilaspur Municipal council president Rajani Sharma participated in the protest. BJP leaders said they just want to hoist the national flag at the LAL chowk. Party and its workers never wanted confrontation with the Congress or the government in Jammu and Kashmir. Our confrontation was only with separatists. But the Government of India wants confrontation. This incident reminded us of the Emergency days district BJP said. This is for the first time in the history of Independent India that two leaders of the Opposition in Lok Sabha and Rajya Sabha are not allowed to enter Jammu. They requested President of India to interfere in the matter and take the suitable action.